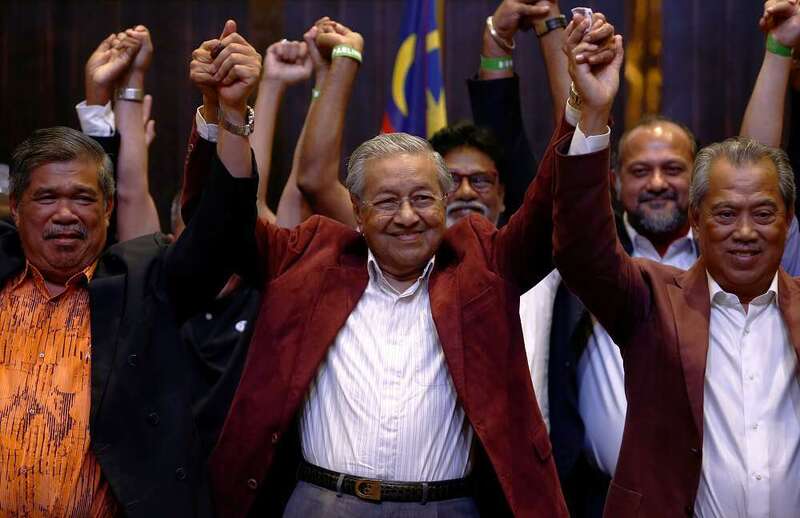 KUALA LUMPUR: The newly-formed Pakatan Harapan (PH) coalition of four opposition parties secured a stunning victory in Malaysia’s just-concluded general election that ended over 60 years of uninterrrupted rule by the Barisan Nasional (BN). Former Prime Minister Tun Dr Mahathir Mohamad at almost 93 years old achieved what virtually everyone thought was the impossible task of galvanising mass support against the once impregnable BN’s grip on power which before today’s historic defeat was the world’s longest ruling political party. Dr Mahathir is expected to be sworn in as Malaysia’s seventh prime minister later today. Dr Mahathir was the fourth prime minister and ironically the same man who led the BN to victory in five successive general elections from 1982 to 1999. When the final results were announced by Election Commission chairman Tan Sri Hashim Abdullah at around 4.45am , PH which fought what is billed as the mother of all elections using its affiliate Parti Keadilan Rakyat ‘s (PKR) light blue eye symbol, won 113 out of 222 seats in Parliament for a simple majority. It is expected to strengthen further its strength in Parliament with eight more seats that were won by Parti Warisan Sabah which had announced recently that it would go into a pact with PH at the federal level. The BN led by caretaker Prime Minister Datuk Seri Najib Razak managed to win only 79 seats, a far cry from 132 that it had in the last Parliament seats. Signs of a political tsunami or people’s power began to emerge from around 10pm when the BN lost states like Melaka and Negeri Sembilan to PH while the Islamist PAS retained Kelantan with even bigger margins and got an unexpected bonus by winning Terengganu. PH’s component parties PKR and DAP retained Malaysia’s industrial states of Selangor and Penang even more convincingly. Two others – Perak and Kedah- saw keen tussles and ended up with a hung State Legislative Assembly each but how the political drama in these states would play out would become more apparent in the coming hours. Even Sabah and Sarawak, long dubbed the BN’s “fixed deposit” states for always delivering the Parliamentary seats to enable the BN to hold power in Putrajaya, the Federal administrative capital, crumbled under the sheer weight of a more discerning electorate with sizeable voters from Generation Y.
Sabah led by Chief Minister Tan Sri Musa Aman for the last 15 years at press time remained in a deadlock at the State Legislature level with BN winning 29 seats, Warisan 21, DAP and PKR (both in PH) with six and two respectively with another two seats won by Parti Solidariti Tanahairku. Party officials said talks would be held later today to thrash out the stalemate on which party would get to form the new state government. The opposition parties performed better in the battle for Parliamentary seats with Warisan winning eight, three each for DAP and PKR and one seat for Solidariti. It was obvious that the once mighty BN’s defeat was further fueled by the far-reaching influence that the opposition wielded over the social media bombarding it with issues of cost of living that has gone up hitting everybody’s pocket after Najib introduced the 6% Goods and Services Tax (GST) in 2014. The BN’s popularity shrank further in the last few years with the 1MDB debacle haunting Najib coupled with financial problems within Felda that unsettled the palm oil smallholders and lately the controversial legislations like the Anti-Fake News Act that was rushed through Parliament just before its dissolution on April 7.